Sand Island is one of the Apostle Islands, in northern Wisconsin, in Lake Superior, and is part of the Apostle Islands National Lakeshore. It is located in the Town of Bayfield in Bayfield County. The Sand Island Light, Hokenson Fishing Dock, the Sevona Cabin, the Shaw Farm and the West Bay Club are located on the island. There is another Sand Island Lake Chippewa in Sawyer County, Wisconsin. In 1870 Francis (Frank) Shaw, from Sandusky, Ohio, came to La Pointe, apparently to investigate establishing a fishing business, and purchased thirty-seven acres of land along the southeastern shore of Sand Island. In May 1871 Frank Shaw was setting pound nets in Chequamegon Bay, but in the winter the Shaws returned to Sandusky. For the next several years it appears that the Shaws maintained homes in both La Pointe and Sandusky until they left Sandusky permanently in the mid-1870s. During this time, Frank Shaw was developing his Sand Island fish camp. But unlike other fishermen with camps on Sand Island at that time, Shaw owned the land. In the early 1880s the Shaws moved their primary residence from La Pointe to Bayfield. About this time the Sand Island property began to serve as a summer home for the family, while Frank Shaw stayed out from spring until fall. By the mid-1880s, perhaps earlier, Shaw was planting crops on the island. Fishing, however, remained his primary occupation. During the 1890s Shaw maintained a fishing fleet of more than four boats and usually hired at least three men to assist him. In 1895 Fifield wrote of “Shaw’s Landing”: “Captain Frank Shaw has a good snug farm at this point, where he has been for the past twenty years engaged in fishing and farming.” In 1897 Frank and Josephine Shaw began to live on Sand Island year round. As Frank Shaw developed his fish camp into a home, farm, and expanded the fishing operation, he built a log building (the first house) on the shore, a log and frame house farther inland, a root cellar, workshop, smokehouse, and additional buildings. In 1898 he expanded his dock, which had a fish house at the end. A number of these buildings survive today as part of the National Register-listed Shaw-Hill farm. Louis Moe (Lars Eliason) was one of the first Norwegian settlers on Sand Island. Moe had been a fisherman in Mo-i- Rana, Norway. In 1893 he filed a homestead claim for an inland parcel on Sand Island, but soon afterwards he purchased a farm and fishing complex on East Bay that had been developed by another Norwegian. Peter and Dorothea Hansen and their children Frederick and Christine emigrated from Norway to Sand Island shortly after Moe settled on the island. The Hansens knew Moe in Norway and fished for him on Sand Island until they earned enough money to buy their own boat. Christine married Peter Johnson, another island fisherman who had emigrated from Norway. In June 1895 the Wisconsin state census taker counted forty-six residents on Sand Island. This did not include the Shaws, who were listed in the village of Bayfield, but it did include lighthouse keeper Emmanuel Luick and his wife Ella. Nineteen of the forty-six were men living alone. It seems likely that most of these men occupied fish camps although some may have had more permanent establishments like that of Louis Moe. The census counted eleven females in seven households, indicating that there were families on the island. Although the Sand Island men were fishermen first, those with families grew at least enough food to feed them. About a third of the residents were Scandinavian-born; the remainder were born in the U.S. In 1899 Louis Moe traveled to Mo-i-Rana to get married, returning to Sand Island with his wife. Peter Johnson’s brother Herman arrived from Norway at about the same time. With the Shaws, the island’s permanent population slowly began to grow, establishing a base for the twentieth century community. In 1886, newspaper publisher Samuel Fifield opened Camp Stella—the first resort in the Apostle Islands. Camp Stella offered rustic accommodations where guests could escape hay fever and experience nature. In the early 1900s, Sand Island grew into a community, with enough families living there year-round to support a school, a post office, and a cooperative store. Norwegian fishermen and their families settled at East Bay. Louis Moe’s home and farm included buildings for fishing, farming, and logging. Peter and Dorothea Hansen and their son Fred formed another household until 1904, when Fred, at age twenty, married Agnetta (Nettie) Johnson, daughter of Jacob Johnson. Fred built a house on the waterfront not far from his father. When Peter Johnson and his family moved to Washington State about 1900, his brother Herman purchased his house and fishing rig (boat and equipment). Herman Johnson married Hattie Hovland in 1906, establishing another family at East Bay. Harold Dahl came to Bayfield in the early 1900s and by 1910 had moved with his family to Sand Island. Sand Island’s Norwegian fishermen sold their fish to Jacob Johnson’s fish company, sometimes working for the company directly. Jacob Johnson lived in Bayfield and operated the Jacob Johnson Fish Company from 1898 to 1910 when he moved to Seattle. Although Johnson’s primary residence was Bayfield, he had a house at East Bay and reportedly amassed considerable land holdings on Sand Island that he sold when he left the area. Moe, Dahl, the Hansens, and the Johnsons were fisherman who farmed secondarily to supplement their food supply and sometimes their income. Between 1909 and 1912 land promoter Edwin Bonde—himself a Norwegian immigrant—persuaded numerous Norwegian families from the Minneapolis and St. Paul area to come to Sand Island to establish farms. Bonde was a nurseryman/horticulturist who purchased and subdivided land and planted fruit trees and ginseng. In addition to Bonde, the Palms, Loftfields, and Norings all built homes on or near East Bay and had limited success at farming and living permanently on the island. Swen Bergstrom, a carpenter, was the only Swede living on the island during this period. The community that developed on Sand Island in the early twentieth century had much in common with the community on nearby but much larger Madeline Island. On both islands, the economy was based on fishing and farming with an important assist from tourism. At its peak in the 1910s, the year-round population of Sand Island numbered about seventy people, most of them living at East Bay. The one-room school built on the island in 1910 was key to enabling families to live there year round. In the years that followed, the Sand Island community acquired a post office, a cooperative store, and—briefly—telephone service to the mainland. The summer community grew also. Although Camp Stella closed after Sam Fifield died in 1915, it was a catalyst for summer homes on the island, including the Campbell home near Shaw Point, the West Bay Club, and a small enclave of summer homes at East Bay. Meanwhile, at Shaw Point, Frank and Josephine Shaw lived year-round in their Sand Island home until November 1905, when they moved to Bayfield for the winter due to Josephine’s poor health. For the next few years, the Shaws moved to Sand Island in the spring and wintered in Bayfield until fall 1908 when Josephine Shaw became seriously ill. In 1910 Frank Shaw sold his fishing rig and Sand Island property to his son-in-law, Burt Hill. Josephine Shaw died in 1911 followed by Frank Shaw in 1914. Burton (Burt) Hill was born in Appleton, Wisconsin, in 1871 and in 1888 moved with his parents to La Pointe, where his mother opened an eating house and later a hotel. In 1889 Hill became an apprentice in a printing shop, and from 1891 until 1910 he worked for the Bayfield County Press, most of that time as foreman. When Burt Hill and Anna Mae Shaw were married in November 1894, the Bayfield County Press printed a list of more than one hundred wedding gifts given to the popular couple. Before 1910 the Hills spent part of each summer on Sand Island with the Shaws. When Hill purchased Frank Shaw’s Sand Island home, farm, and fishing rig it was time for both of them. Suffering from diabetes and “printer’s ink disease,” Burt Hill was looking for a healthier lifestyle that seemed to be available on Sand Island. In 1910 Burt and Anna Mae Hill made Sand Island their year-round home, and Burt Hill learned pound net fishing from his father-in-law. Bertam and Bergit 'Noreng' (Noring), came from Norway to the USA on their honeymoon. They arrived at Ellis Island on May 2, 1906, on the ship called Oscar II. (Ref Ancestry.com, personal testimony confirmation by Harold Noreng). After living in Minnesota for a while, they heard about the opportunities in the Bayfield and Apostle Island area to own their own land. They bought land on Sand Island. Harold A. Noreng, their 5th child, was the last child born on Sand Island (July 8, 1920). His older siblings were William, Helen, Signe, and Norman. The industrious Norwegian family cleared the trees and built a home on the interior of Sand Island. There the Noreng family farmed and fished Lake Superior year round for whitefish, chubs, and lake trout. Fishnets were repaired with handmade net shuttles (needles) made of wood. Bonfires were built on shore to notify others to send a small rowboat to pick them up from the mainland. Crossing Lake Superior waters could be dangerous with large waves and strong winds, and bitter cold in late fall. In the winter, people could walk or take the horse-drawn sled to the mainland over the ice. When other pioneer families on Sand Island came to visit, a feast was held, followed by music on the front porch: harmonica, guitar, violin, and accordion accompanied those who sang both Norwegian and American songs. In January 1911 Louis Moe, on a visit to Bayfield, reported that there were fifty-six people living on Sand Island. In January 1920 the federal census counted forty-four people, more than 90 percent of the Norwegian or Norwegian- American. Considering that several families moved to the island after 1911 and more children were born, it seems likely that the 1920 census missed some people. On the other hand, Elvis Moe’s recollection that more than one hundred people lived on Sand Island following World War I may be too high. The one-room school built in 1910 was key to enabling families to live on the island year round. Before the school was built, families with school-age children often moved to Bayfield for the school term. Children in grades one through eight attended the Sand Island School; there were sixteen students in the first year, 1910–11, and twenty-seven students at its peak. The school also served as a center for community events. Moe reported that all fifty-six island residents attended the Christmas party and chicken dinner that took place at the schoolhouse in December 1910. Today, only the schoolhouse foundation remains. In 1911 Burt Hill organized the Shaw Post Office on Sand Island, completing the application and taking the postmaster’s examination. Hill was appointed postmaster in June. Mail delivery was relatively easy when the lake was open—S. L. Boutin’s collecting boat delivered the mail three times a week when it picked up fish.86 During the winter Hill had to walk across the ice and rendezvous with the mail carrier from Bayfield. He stuck it out for nearly five years before resigning in February 1916. The Shaw Post Office closed officially in May. Before then, in 1915, Hill and other island residents began working toward bringing telephone service to Sand Island. After more than two years, the Sand Island Telephone Company was organized in April 1918 with fifteen thousand dollars worth of stock that had been raised by island residents. Burt Hill, Louis Moe, and A. H. Wilkerson was elected directors of the company, and they, in turn, elected Moe President, Magnus Palm vice-president, Hill secretary, and Herman Johnson treasurer. An underwater cable connecting Sand Island to Bayfield was completed in October 1918, and the first message—announcing the signing of the Armistice—went out over the line; regular telephone service began in December. However, the cable was soon severed and was too costly and difficult to repair, ending telephone service to Sand Island. On Sand Island, most of the younger generation moved away when they became adults, not just because farming was difficult, but because the entire way of life was difficult. The school on Sand Island closed in 1928. 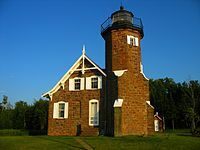 In 1921 an automatic acetylene gas burner was installed at the Sand Island light, making it the first automated lighthouse in the Apostle Islands. A few years later the Sand Island lighthouse was leased to summer resident Gert Wellisch. The Great Depression of the 1930s reinforced some trends and altered others. It hastened the decline of logging, slowed the growth of tourism, and sent people back to the land—and water—to grow and catch their own food. The Depression also shook up the commercial fishing industry. The Boutin Fish Company went out of business after more than sixty years as a leader in the local fishing industry. The fishing, however, was better than ever, and whitefish again accounted for a significant portion of the commercial catch. Herman Johnson Jr., a second-generation Sand Island fisherman, left Sand Island and established a fishery not far from the Hokensons at Little Sand Bay. This page was last edited on 6 March 2019, at 01:34 (UTC).